Austin’s Premier Microblading | Permanent Makeup Studio and Training Academy. 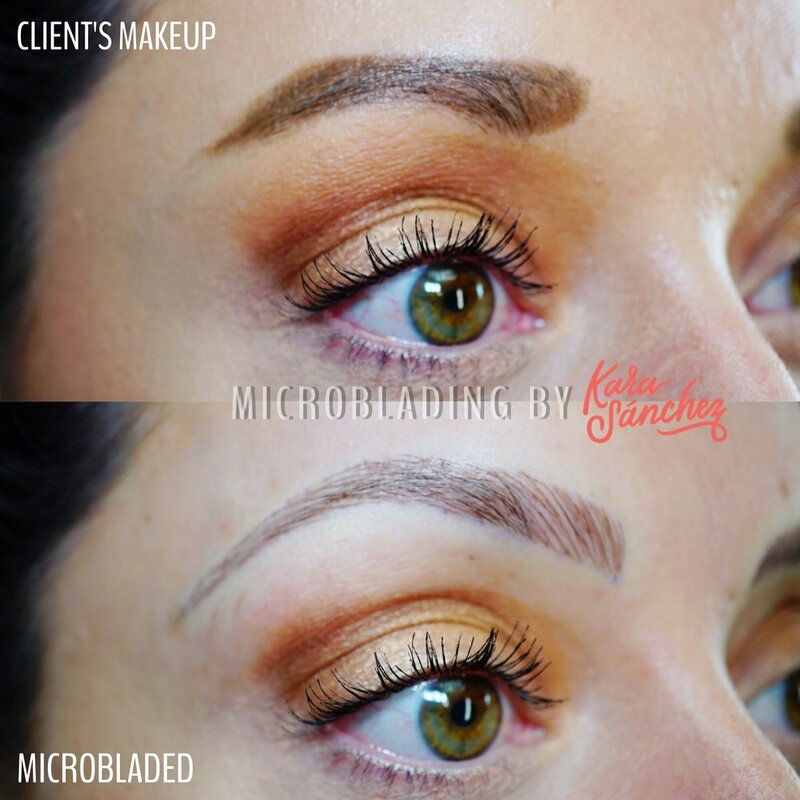 To see what to expect from your microblading session, click the video below! Focused on brows since 1997, with the first Brow Studio in Orlando (2006). Licensed Esthetician & trained under Anastasia Soare, creator of Anastasia Beverly Hills. Offering a way to perfect brows through a semi-permanent procedure. Originally certified by Lindsey Ta at MicrobladingLA. Returning for advanced courses including the Ombré/Softtap method under Rebecca Chung, founder of Princess Brows Hong Kong. Additionally certified PMU artist by Roberta Peixoto Academy for Nano Brows/Micropigmentation. Being the only artist in Austin to offer this service and only the second in Texas to be trained on this European method. Building on the PMU work Kara was invited to become a National Trainer for the cutting edge PMU Amiea machine where she trained under Suzé Styel from South Africa and Elena Nikora from Germany. Because Kara believes to be the best you must work and learn from the best, she just completed an advanced Nano Brows training under Hoi Kwan in Calgary, Canada as well as under the direction of internationally recognized, Suzé Styel in Cape Town, South Africa. GRADUATE OF COLLEGE OF CHARLESTON | PARAMEDICAL ESTHETICIAN FROM FCNH | CERTIFIED MICROBLADER | TRAINER | CERTIFIED PMU | LICENSED AND INSURED. Results last 1-2 years and the procedure is pain free. As an added safety measure we use only high-grade, water based, Kosher, Vegan pigments and disposable implements. Touch-up appointments can be rescheduled within 72hrs to avoid $150 cancelation fee. Includes one touch-up treatment within 5-8 weeks and your take home care kit. There is zero down time! You'll leave looking fresh and perfect, there's no redness or evidence you just had something semi-permanent done. This method is most effective for normal to dry, less mature skin. Combo Brows, is the best of both worlds. Strokes are done using microblading followed by subtle shading using a digital device. Shading lends to a more realistic look. This method is most effective for those who desire a the most dimensional brow or shapes that require more correction. 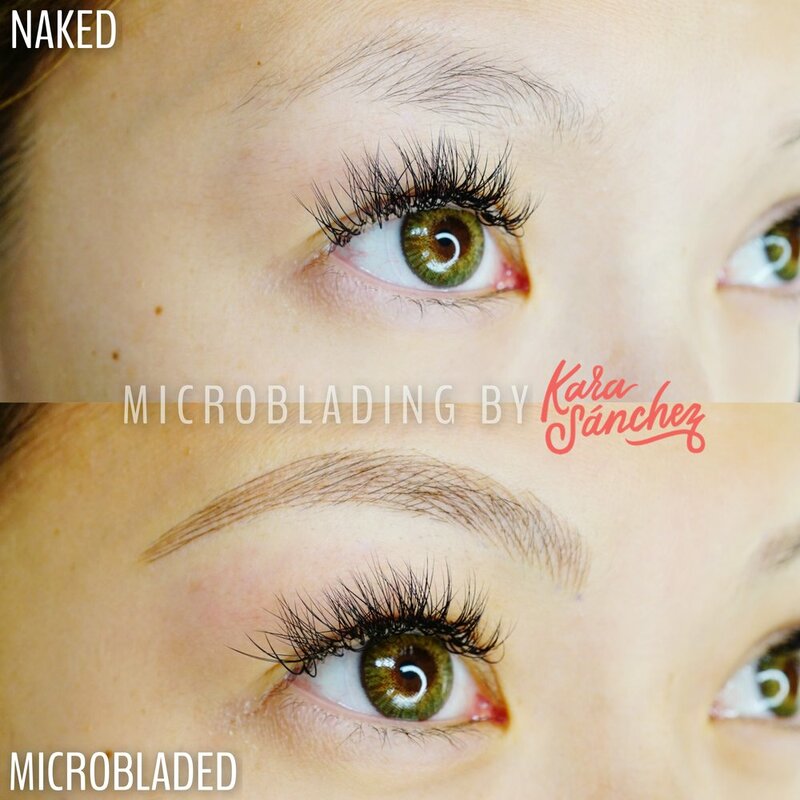 Nano Brows, is the next generation for Microblading. Done with a digital device which causes less trauma. Both device strokes and shading are included. There is some redness involved and nano brows are darkest immediately following your appointment. Includes one touch-up treatment within 2-3 months and your take home care kit. This method is most effective for oily, delicate, mature skin or those seeking corrective work. This service is for anyone who currently has ANY microblading or tattoo by another artist in need of touch ups or correction. 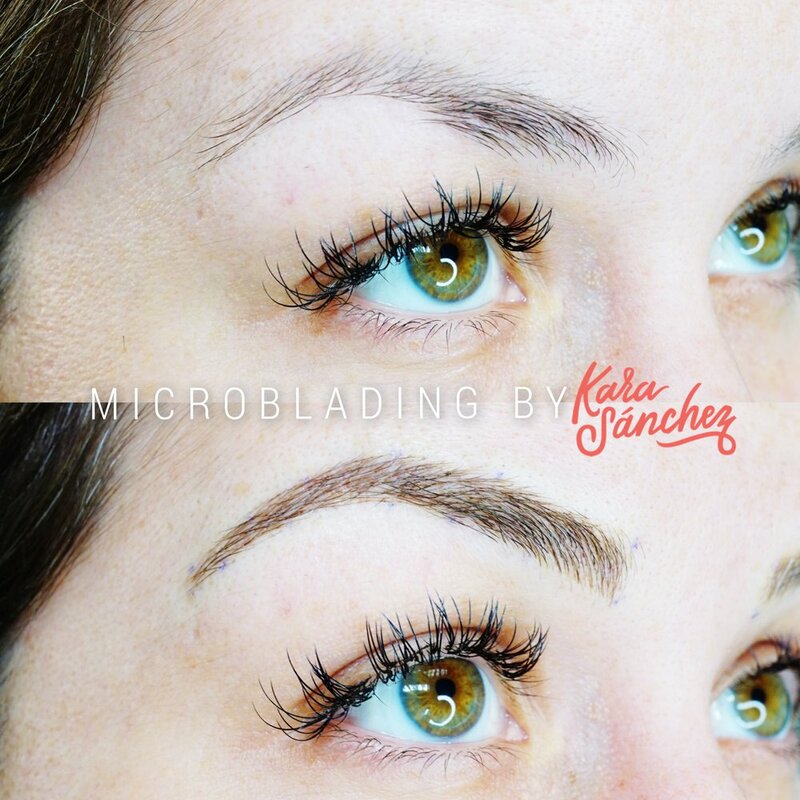 Appointments aimed at correcting prior microblading done elsewhere or old tattoo may require more than 2 appointments and cannot be scheduled without Kara's review of recent photos of the current state of your brows. Please email those to hello@KaraSanchez.com IF she is able to help you, we will get you scheduled! Not ready to commit yet? That's ok! Come in for a consultation to discuss your options, your best shape, coloring and any questions you may have with Kara. Consultations are non-refundable and will be taken off your balance when you come in for treatment. Within 12 months of 5 week touch-up. After 12 months from 5week touch-up. Available for current clients only. REFER A FRIEND = YOU GET $25! PREGNANT, BREASTFEEDING, ON BLOOD THINNERS OR CHEMO? WE CAN’T SEE YOU WITHOUT A DOCTOR’S CONSENT. Click the video below to see the ENTIRE PROCESS beginning to end! Including healing and touch up. I started this program in honor of my best friend Nicole Cafarella Bernard who we lost to leukemia. We met 15 years ago over makeup, of course and she was my biggest fan. Nicole left four beautiful children behind and was taken from us in her thirties. If you have someone going through cancer and would like to nominate them, every month I choose a survivor to gift them microblading. It's a small way that I can honor her and give back. 3 times per year Kara dedicates a full day to treating 12 survivors. Please send their story and oncology clearance letter to Hello@KaraSanchez.com Thank you for helping me pay it forward. Since there is cutting/trauma involved, which can make the receiver susceptible to infection, a letter proving from the recipient's oncologist stating they are able to undergo microblading must be received before consideration. To stay true to this program I ask you do not request to be considered if you are not a cancer survivor. Thank you. Recipients who are late or cancel forfeit their gift to the next person on the waiting list. As of January 2018, a $100 deposit must be paid to schedule this appointment however after the 5-8 week touch up appointment 100% of the deposit will be donated to the Leukemia & Lymphoma Society. This is to ensure that appointments begin on time. Yearly color boosts can be booked on-line if needed.